Travel has become an important part of people's life and a fitted transport is the key. If the destination is several hundred kilometers, private car is absolutely necessary. However, when people get to the destination, how to enjoy the beautiful scenery and culture there? By walking? That's not a good idea. Walking in travelling has two shortcomings. On the one hand, it is too slow, especially visiting some large-scale scenery spots. Spending several hours to enjoy one spot is too time-consuming. On the other hand, walking makes riders fatigued easily, which will disappoint travelling mood. It will be perfect if there is a tool that can replace walking. 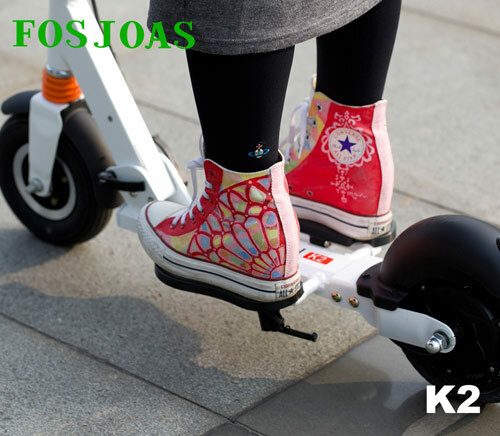 Fosjoas K2 self-balancing scooters is the best choice and it makes long-distance journey worry-free. Fosjoas K2 2-wheeled electric scooter adopts front-riding mode with front and back wheels and two pedals on flank, which caters for human engineering and makes riding comfortable. It is also equipped with an adjustable operating arm, which can be adjusted according to the height of riders so as to offer the most comfortable riding experience. Plus, it offers the maximum loading capacity of 100kg. Therefore, most of people are able to ride Fosjoas K2 electric scooter at ease. Up-equipped and replaceable battery unit is the most outstanding highlight of Fosjoas K2 two wheel electric scooter unicycle that provides people a worry-free journey. The up-equipped feature makes Fosjoas K2 scooter suitable for all weather conditions and road conditions, whether it is rainy day or muddy road. Replaceable characteristic offers unlimited range, which makes long-distance travel be possible. Fosjoas K2 electric scooter has two battery capacities: 81.4Wh and 162.8Wh. The maximum range it can reach up to is 20km. If the distance is too long, riders can take more speared batteries. In addition, Fosjoas K2 scooter has multiple folding systems and thus it can be folded into small size and put in trunk easily.